Connect Gift Up! to your WooCommerce store and we will enable your Gift Up! gift card codes to be used during checkout. Firstly, you'll need our WordPress plugin. It's available using the standard WordPress plugin store via your WP dashboard. Go to WordPress Settings > Gift Up! 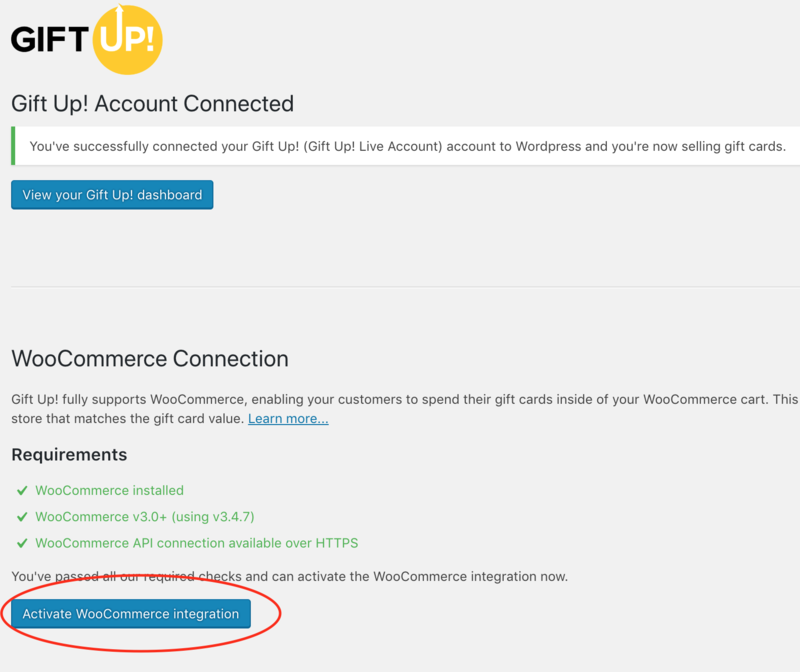 Click the button labelled "Activate WooCommerce integration"
Grant access for Gift Up! to access your WooCommerce store data and you'll be all set! When you sell a gift card in your Gift Up! 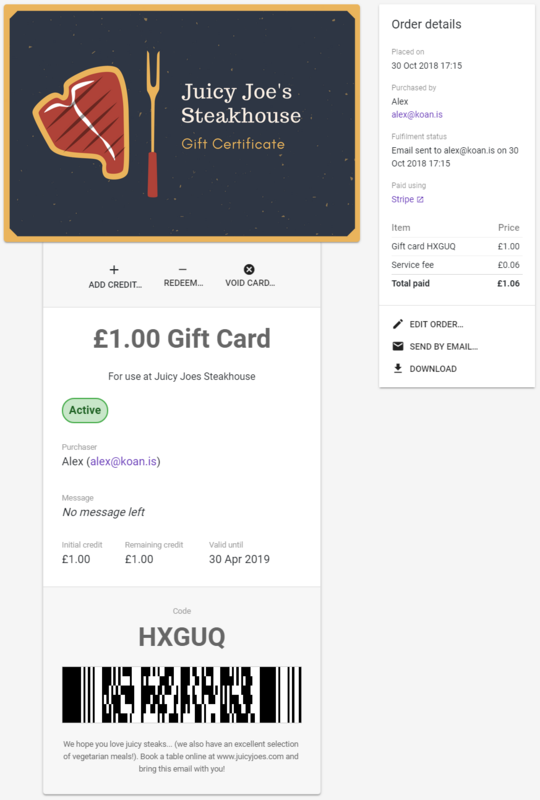 checkout (which you can install on your website, instructions here) we will automatically create a discount coupon of the gift card balance in WooCommerce that matches the 5 character alpha-numeric code that we create. In the instance above, the coupon gets deleted automatically by WooCommerce (as the original discount coupon was a one time use only coupon), but when the order gets placed in WooCommerce, we get notified and we reduce the gift card balance in Gift Up! to $20 and immediately re-create the discount coupon with the exact same code again, but this time with a $20 balance so your customer can come along again and place another order and use their remaining balance. When we create the discount coupon in WooCommerce, it cannot be used against any shipping costs. Why do I have to install your checkout as well, can I not setup a product in WooCommerce (called something like "gift card")? I'm afraid not. The simple reason being that whilst we could look for all orders coming from WooCommerce containing that product, we would not know where to send it to, or when. In our checkout your customers can be very specific about who gets the gift card and crucially, when. During the WooCommerce checkout it's not possible to collect this information, plus WooCommerce asks for postal address information, which would really confuse your gift card buyers as our gift cards are sent by email.